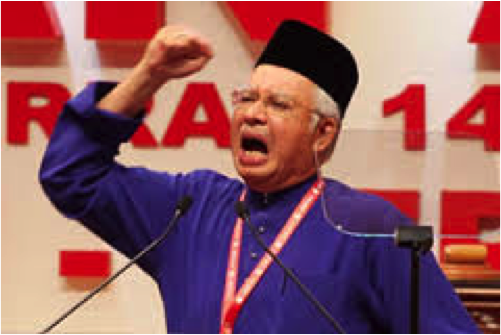 In the last few weeks there have been fresh calls for Prime Minister Datuk Seri Najib Tun Razak to step down. While not new it has acquired particular significance because the demands for his resignation now seem to be coming from within the premier’s own party. The latest call for Najib to step down came from veteran journalist and reputed Mahathir mouthpiece, Datuk Kadir Jasin. Speculation abounds that the puppet master of Malaysian politics is scheming to remove yet another prime minister but that is another story. Few will lose much sleep over Najib’s departure. He has proven to be an abysmally poor leader. His incompetence, indifference, and indecisiveness has allowed our nation to fall deeper into disrepair. The national ledger is a sorry record of plunder, mismanagement and despair. Unsurprisingly, the electorate repudiated both UMNO [United Malay National Organization] and its leader in the last general election. The key question, however, is not whether Najib should go but rather who will take his place. Who is there that is capable and qualified, that has integrity and character? Who is there with a proven track record of dedicated and selfless public service? Who is there with the vision and the courage to do what’s right? Who is there that could bring out the best in our nation instead of pandering to the worst? Who is there that we can trust with the immense power of the office of prime minister? Kadir, and those he speaks for, appear to be more concerned about saving the party through a change of leadership rather than saving the nation through a change of direction. It is worth remembering that we have now had two prime ministers, courtesy of UMNO, who have been a disaster. It’s not just their weak leadership and incompetence that’s to blame but the fact that they mindlessly continued the same flawed, discredited and reckless policies of their party that were put in place by Dr. Mahathir. We cannot afford yet another prime minster cut from the same cloth. If UMNO truly wants to survive and thrive, it needs not just a change of leadership but a change of heart. In the midst of its soul searching, the hope is that UMNO will not just shop around for better leaders but for more enlightened policies as well. How about an UMNO that champions the rights and interests of all Malaysians irrespective of race, religion or gender, that values and treats all citizens with respect and dignity, that aims to lift up all of Malaysia’s sons and daughters and help them achieve their best instead of dividing them, putting them down, hindering their advance, marginalizing them or demonizing them? How about an UMNO that is more interested in ketuanan rakyaat rather than ketuanan Melayu? How about an UMNO that inspires hope rather than instils fear and suspicion? How about an UMNO that goes beyond strengthening consensual leadership within the party to forging the kind of national consensus that alone can restore stability, peace and progress? How about an UMNO that fights for the economic betterment of all Malaysians rather than playing off one group against another? How about an UMNO that is sensitive to the daily struggle of ordinary Malaysians instead of the cronies who are plundering so much of our national wealth? How about an UMNO that uncompromisingly defends the religious rights of all Malaysians, standing up fearlessly to those who preach hatred, division and intolerance instead of politicizing religion, manipulating it for political advantage and tolerating groups like PERKASA & ISMA? How about an UMNO that commits itself to good governance, openness, accountability, and transparency instead of secret deals and never-ending scandals, an UMNO that declares war on corruption and waste wherever it may be found instead of the ‘sandiwara’ that now passes for an anti-corruption programme? How about an UMNO that seeks to defend both the spirit and the letter of our constitution, that cherishes our liberal democratic tradition, that plays by the rules of democracy instead of undermining and politicising our national institutions? How about an UMNO that respects the will of the people even when they vote the opposition? How about an UMNO that seeks to nurture a culture of freedom rather than repression through anti-democratic measures like the Sedition Act? How about an UMNO that respects diversity of thought, opinion and ideas instead of demonizing and criminalizing dissent? How about an UMNO that seeks to lead us into a new age of renewal and revival based on great ideas, noble values and farsighted policies that release the full potential, creativity and innovation of all our people rather than trapping us in apartheid-like structures that keep our nation from being competitive in a rapidly changing world? Kadir Jassin, in his article, argued that UMNO faces a choice between Najib and Putrajaya but that is a false choice. The real choice is between democracy and tyranny, freedom and oppression, integrity and moral bankruptcy, justice and impunity, unity and disharmony and standing up for what’s right instead of playing along with what’s wrong. If UMNO wants to recover the moral high ground, if it is even capable of thinking about the moral high ground, then let it strive to build the dream of Malaysia that our founding fathers envisaged when we began this journey as a nation in 1957. In the Book of Proverbs, it is written that “Righteousness exalts a nation but sin is a disgrace to any people.” Those who lead with the kind of righteous behaviour that exalts our nation will surely find the ready support of the people.